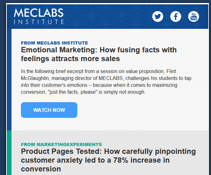 MECLABS is an institute that conducts real-world research focused on understanding the cognitive psychology of conversion — why people say “yes.” Several of our experts are available for interviews for marketing and business stories. 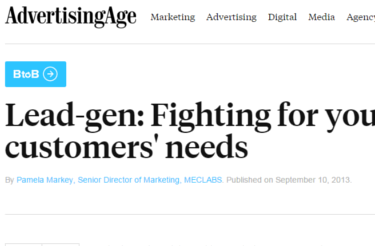 "Brand is the aggregate experience of the value proposition,” says Flint McGlaughlin, CEO and managing director of MECLABS Institute. “The value proposition should foster a conclusion. 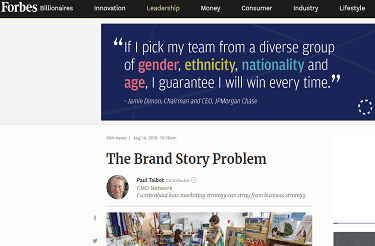 The brand should support that conclusion with a correlated impression." "According to a MarketingSherpa study, email is the method of communication preferred by customers. The vast majority of US adults (72%) prefer to communicate with companies in this way, while 91% say they like receiving promotional emails from companies with which they have made a purchase." And we humans, we’re a fickle species. We change jobs and companies more frequently than ever before. 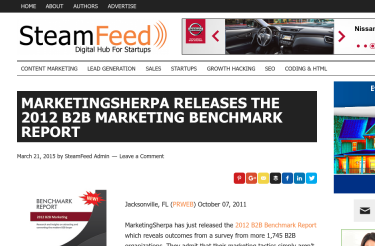 According to Marketing Sherpa's research, marketing databases naturally degrade by about 22.5% each year. 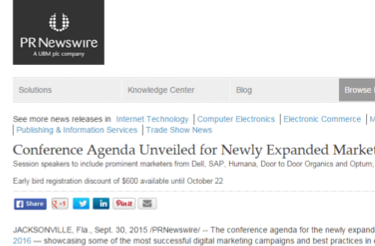 As a result, B2B databases are often cluttered with inaccurate, outdated or incomplete records.
" 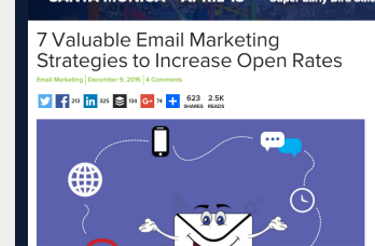 ... a recent MarketingSherpa study of more than 2,000 American adults found that 72% prefer email when it comes to communication with companies." "McCoy looked at solid data to get the answers. 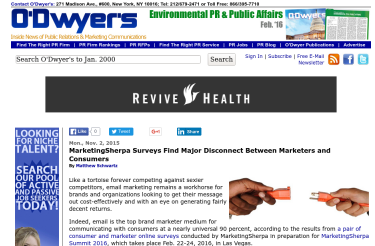 First, she looked at Marketing Sherpa’s research about conversion rates on organic traffic. 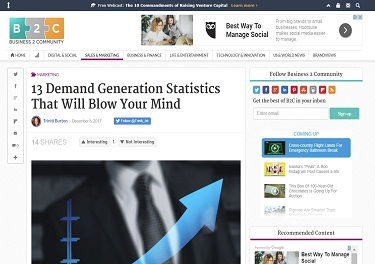 This study found the average conversion rate for traffic-to-leads across industries is 16%." 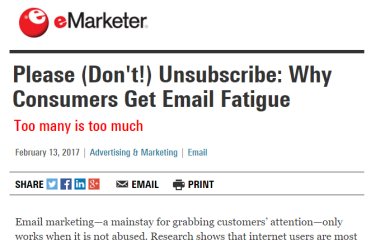 "According to a MarketingSherpa study, the two most common reasons why internet users unsubscribe from email lists is that they get too many emails in general and that they do not find the emails relevant." "In a KYC context, MarketingSherpa’s findings mean that customer data points like address, phone number, email address and related business entities could quickly become irrelevant. Thus, the first question that FIs should ask their vendors is: How often do you validate your data?" "Naked Wines: Increased app downloads by turning onboarding into a game ... MarketingSherpa shared this onboarding case study in 2016." 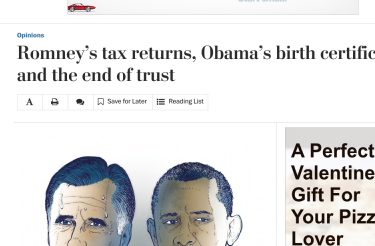 "Interestingly, Marketing Sherpa found that print platforms — magazines and newspapers — are the most trusted advertising platform." 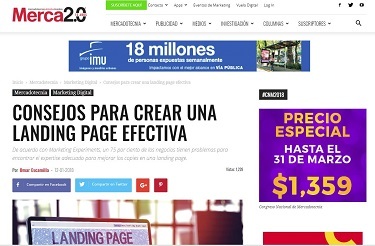 "... de acuerdo con Marketing Experiments, de forma aproximada, un 75 por ciento de los negocios tienen problemas para encontrar el expertise adecuado para mejorar los copies en una landing page." "According to a study published on Marketing Sherpa, email personalization on the basis of segmentation can boost the email revenue by 50%.To ensure your emails aren’t annoying your leads, you might want to understand the email frequency preferences of your subscribers, especially if you’re sending too many emails." "A recent MarketingSherpa study found that 58 percent of social media users follow brands on social media. Considering that more than 2 billion people use various social media platforms worldwide, that means marketers can use social media to interact with an enormous number of prospects via social networks." 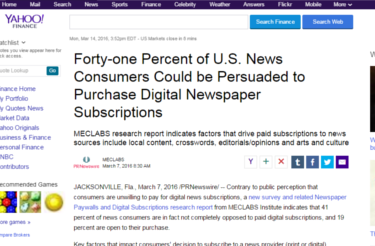 "Marketing in print publications remains standard for many, according MarketingSherpa, a research firm powered by MECLABS Institute in Florida, as it provides a sense of permanence, legitimacy and credibility." Entenda tudo sobre o assunto e descubra 11 conceitos que farão suas páginas converter mais! "A Heurística da Conversão é uma equação desenvolvida pelo Instituto de Pesquisa MECLABS com o objetivo de explicar como funciona esse processo." "Even if you are not getting a lift on every test, you need to learn something about the customer." 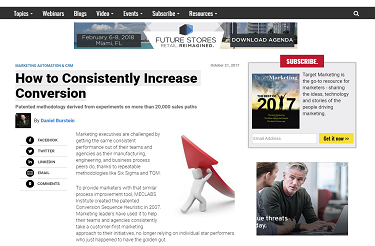 "Only 56% of B2B organizations verify leads before they’re passed to sales (Marketing Sherpa)"
"You can never guarantee Conversion, but using this methodology, you can increase its probability. 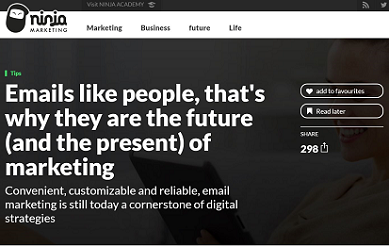 Make sure to choose Conversion objectives that truly serve your ideal customer." 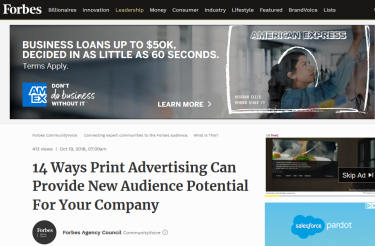 "According to the marketing and research institute MarketingSherpa, print ads are the most trusted advertising channel when consumers want to make a purchase decision. A survey released in January asked 2,400 consumers what medium they trust most when making a purchase decision. 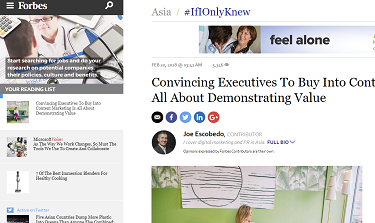 The top source—according to 82 percent of respondents—was newspapers and magazines." Want to Conquer 'Email Fatigue'? Figure out Your Customers' Viewing Behavior. "How quickly does email fatigue set in? Faster than you can say “unsubscribe.” MarketingSherpa recently revealed that just 15 percent of email users surveyed thought that the messages they receive from marketers were always useful." "Dr. Flint McGlaughlin is the founder of MECLABS, the world’s largest independent research institution focused on offer response optimization. His personal work has focused on the philosophy of human choice, experimental design, and the cognitive psychology of conversion." 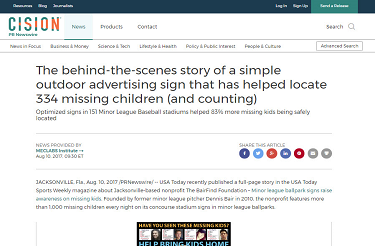 "MECLABS Institute took on BairFind as a pro bono Research Partner after the 2016 baseball season to, in addition to optimizing the nonprofit's website, optimize its signs as well. 'We wanted to find a way to support our community and were inspired to tap into a fan base that has an opportunity to make an impact nationally,' said Ashley Lazo, Director of Marketing, MECLABS Institute." 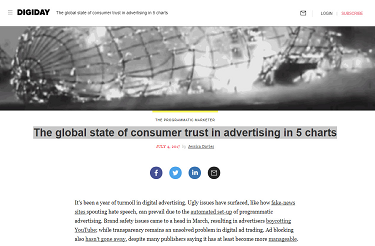 "With ad blocking still rife, it’s unsurprising that online pop-ups are the least trustworthy of all ads, with only 25 percent of Americans saying they’d make a purchase decision directly from that ad format, according to a U.S. study by Marketing Sherpa." Marketers also need to extend this customer-first approach to all of their interactions with customers, according to Burstein, who points out that each interaction will affect what customers think about your brand and what they think about your company and ultimately will affect their level of satisfaction. 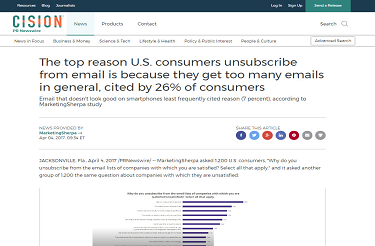 "Email volume is the primary reason why Americans unsubscribe from email marketing lists, according to a recent MarketingSherpa study. 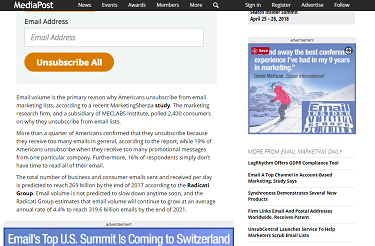 The marketing research firm, and a subsidiary of MECLABS Institute, polled 2,400 consumers on why they unsubscribe from email lists." 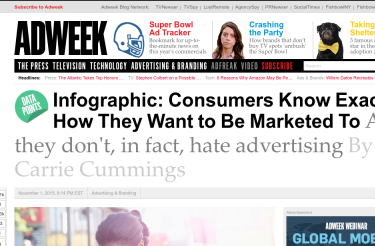 "New, unbiased research from leading universities, academicians, brain psychologists, cognitive psychologists, neuroscientists, and marketing mixed modelers support what we already knew—magazines ads are a valuable component in omnichannel media campaigns. 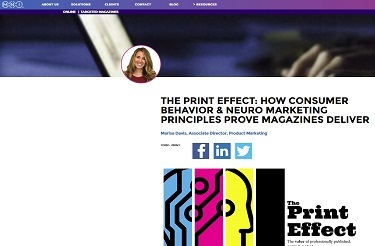 Read our white paper on the ‘Print Effect’ to learn." 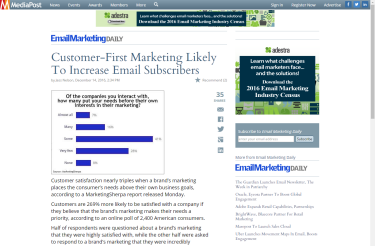 "MarketingSherpa asked 1,200 U.S. consumers, "Why do you unsubscribe from the email lists of companies with which you are satisfied? Select all that apply," and it asked another group of 1,200 the same question about companies with which they are unsatisfied." "Meanwhile, concerns about ad trustworthiness were split by channel in a MarketingSherpa study from October 2016. 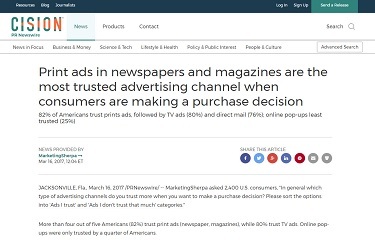 More than eight in 10 respondents said they trust print ads when making a purchase decision, and almost as many said they trust TV ads." 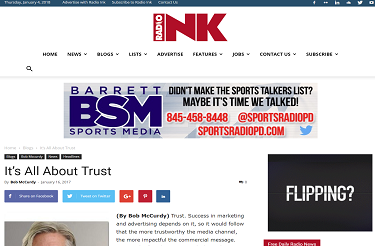 "When discussing channel selection for our marketing & advertising campaigns, the idea that consumers no longer trust mainstream media always seems top-of-mind. So, when we built our Customer Satisfaction Study, we decided to ask American consumers about their preferences." 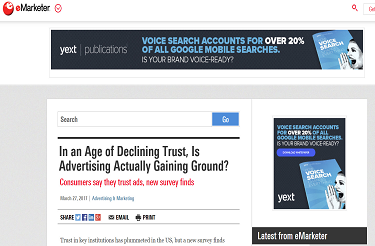 "MarketingSherpa asked 2,400 U.S. consumers, 'How often do you disengage with marketing by doing the following?' 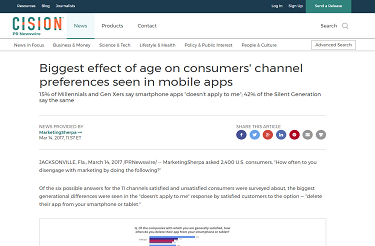 Of the six possible answers for the 11 channels satisfied and unsatisfied consumers were surveyed about, the biggest generational differences were seen in the "doesn't apply to me" response by satisfied customers to the option — 'delete their app from your smartphone or tablet.'" 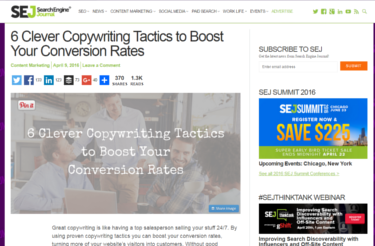 "Each text ad should convey enough information to your audience before you pay for a click. What information is “enough?” Try out this formula from MECLABS Institute." 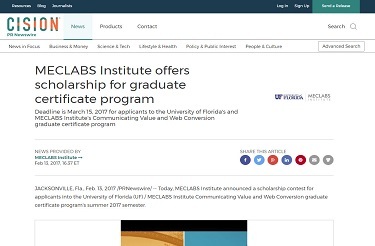 "Today, MECLABS Institute announced a scholarship contest for applicants into the University of Florida (UF) / MECLABS Institute Communicating Value and Web Conversion graduate certificate program's summer 2017 semester." 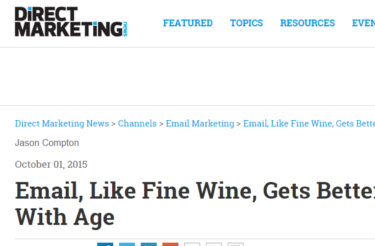 "Email marketing—a mainstay for grabbing customers’ attention—only works when it is not abused. Research shows that internet users are most likely to unsubscribe from email lists because they get too many emails in general." 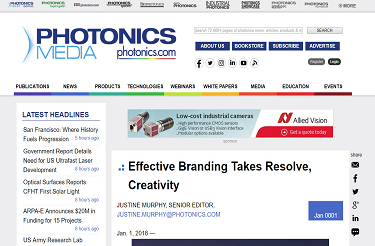 "Digital media’s strengths and considerable benefits are well known by all, but what has been somewhat lost in the digital glare the past decade has been the continued benefits of traditional media and, importantly, the lenses through which the advertising on these channels are perceived." 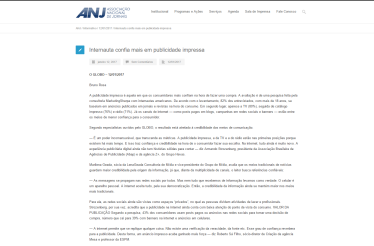 "A publicidade impressa é aquela em que os consumidores mais confiam na hora de fazer uma compra. 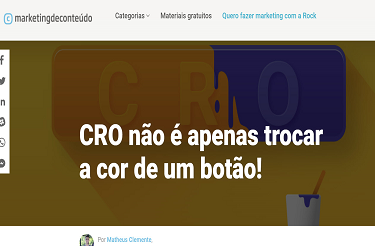 A avaliação é de uma pesquisa feita pela consultoria MarketingSherpa com internautas americanos." 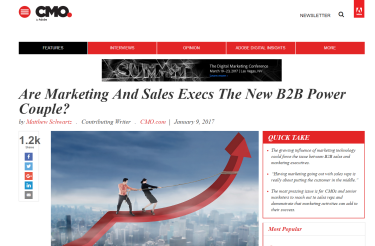 Are Marketing And Sales Execs The New B2B Power Couple? 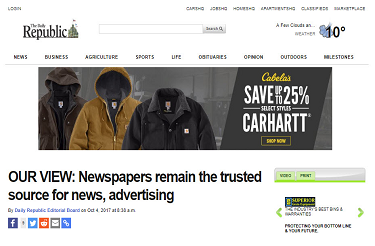 "An October 2016 survey by MarketingSherpa found that 80% or more of US internet users trusted print ads in newspapers, magazines and TV ads when making buying choices. 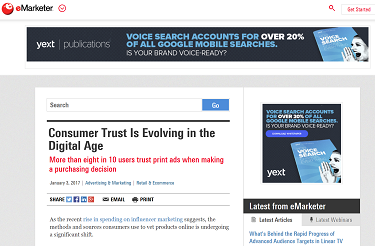 Digital ads fared worse." 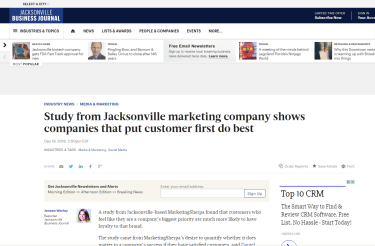 "A study from Jacksonville-based MarketingSherpa found that customers who feel like they are a company’s biggest priority are much more likely to have loyalty to that brand." 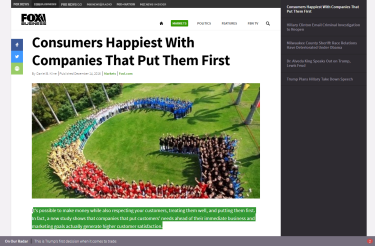 "Putting customers first may seem a straightforward business proposition, but new research has shown that brands that put customers' needs ahead of their immediate marketing goals generate higher customer satisfaction." "It's possible to make money while also respecting your customers, treating them well, and putting them first. 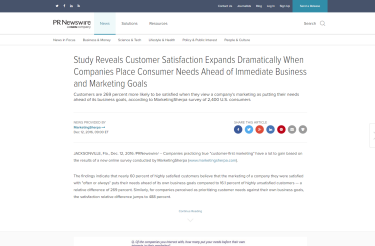 In fact, a new study shows that companies that put customers' needs ahead of their immediate business and marketing goals actually generate higher customer satisfaction." 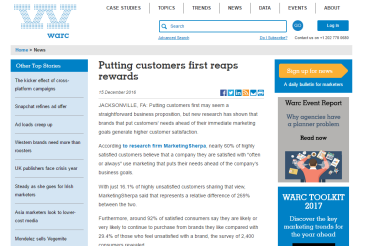 "Customer satisfaction nearly triples when a brand’s marketing places the consumer’s needs above their own business goals, according to a MarketingSherpa report released Monday." "The MarketingSherpa Customer Satisfaction Research study of 2,400 consumers, sampled to reflect a close match to the U.S. population's demographics, was conducted in September and October 2016." 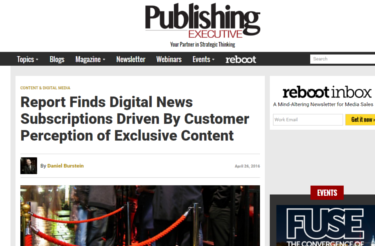 "Publishers should identify and communicate clear value propositions that help customers perceive value that aligns with their motivations to purchase." 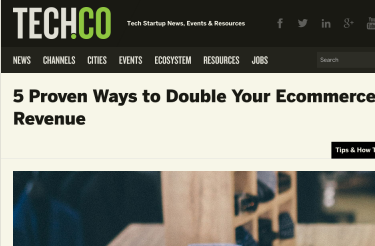 "Conversion rates vary widely depending on the industry. 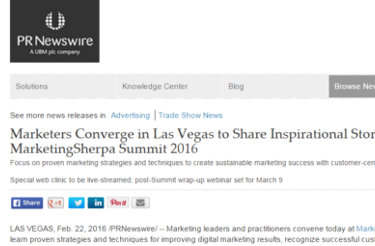 According to MarketingSherpa, average conversion rates by industry range from 10% for professional services to 3% for e-commerce"
Marketing leaders and practitioners convene today at MarketingSherpa Summit 2016 to learn proven strategies and techniques for improving digital marketing results, recognize successful customer-first marketing campaigns and network with their peers. 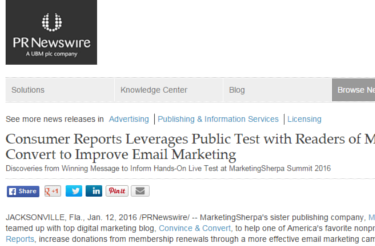 MarketingExperiments has teamed up with top digital marketing blog, Convince & Convert, to help one of America's favorite nonprofit organizations, Consumer Reports, increase donations from membership renewals through a more effective email marketing campaign. 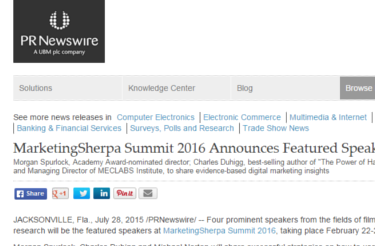 MarketingSherpa Summit named as one of the best marketing conferences to attend in 2016 by Business.com. "According to MarketingSherpa, 72% of American adults indicate a preference for companies to communicate with them via email – but we need to do it better." "Email is the preferred method of communicating with businesses for 72% of adults in the United States, according to a recent study conducted by MarketingSherpa." 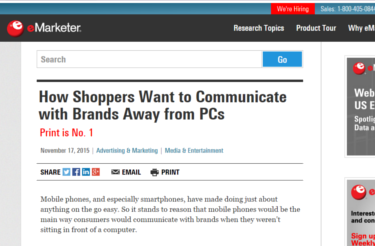 Is Customer Intimacy at the Forefront of your Marketing Campaign? 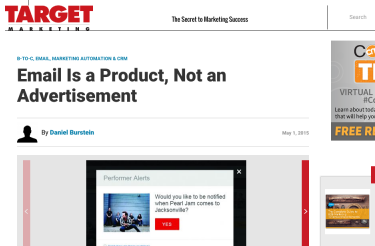 Daniel Burstein, Director of Editorial Content, MarketingSherpa, writes on the importance of focusing on customer intimacy in marketing campaigns. "In fact, according to MarketingSherpa, print ads were US internet users’ preferred way to stay in touch with brands and retailers when away from a computer. Nearly half of those polled in August said so." Optum and Sunrise Senior Living have been named as the winners of this year's MarketingSherpa Best-in-Show and Readers' Choice awards. 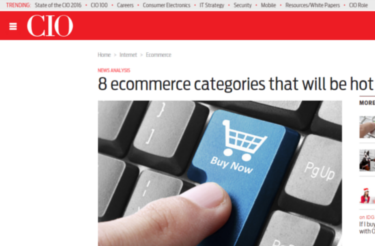 Which ecommerce categories will see increased sales and opportunities in the next 12 months? 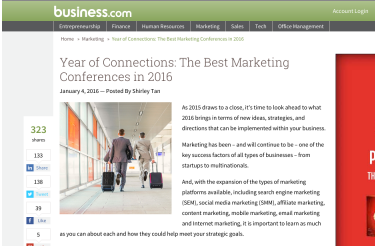 Daniel Burstein, Director of Editorial Content, MarketingSherpa, shares his early 2016 predications. 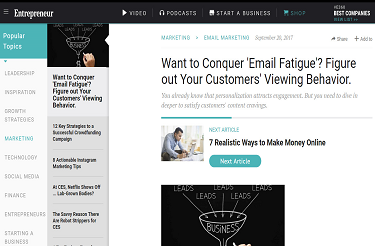 "...research by Marketing Sherpa reported up to a 208 percent increase in conversions by sending targeted emails instead of the regular batch-and-blast email." Indeed, email is the top brand marketer medium for communicating with consumers at a nearly universal 90 percent, according to the results from a pair of consumer and marketer online surveys conducted by MarketingSherpa in preparation for MarketingSherpa Summit 2016. 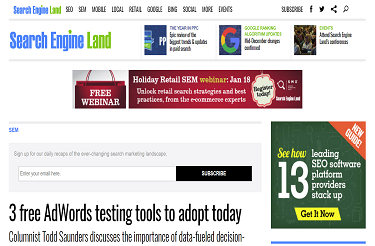 Marketers have a slew of on and offline marketing options today. However, according to research from MarketingSherpa, there’s a disconnect between marketer’s preferred practices and consumer preferences. 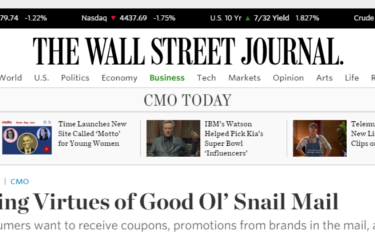 More than half of consumers want to receive coupons, promotions from brands in the mail, according to report from MarketingSherpa. 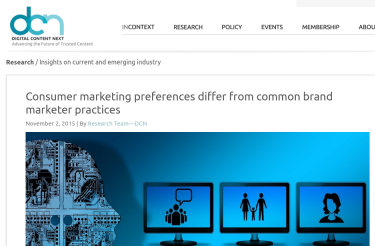 Results indicate major differences in how consumers want to connect with brands versus marketers' actual practices. Data provided by MarketingSherpa asked consumers how they would prefer to receive communications from brands and retailers, and its insights suggest people don't actually hate advertising. 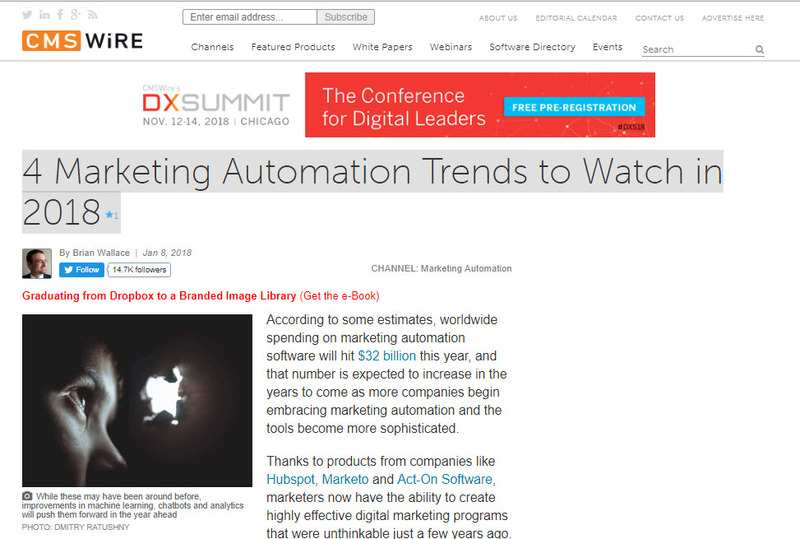 Daniel Burstein, Director of Editorial Content, MECLABS, talks on the evolution of email marketing. 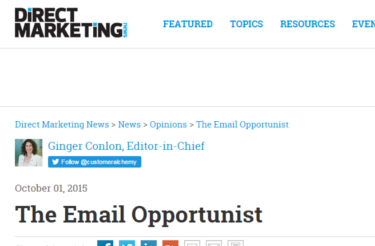 Daniel Burstein, Director of Editorial Content, MECLABS, discusses overcoming the greatest weakness of email marketing. 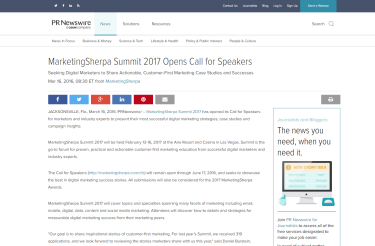 The conference agenda for the newly expanded MarketingSherpa Summit 2016 — showcasing some of the most successful digital marketing campaigns and best practices in email marketing, social media and digital — has been announced. 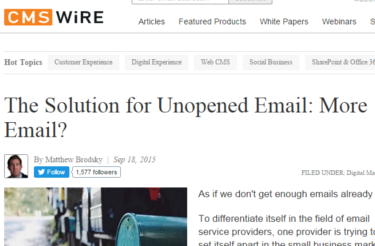 The Solution for Unopened Email: More Email? 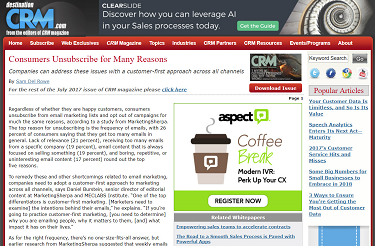 Daniel Burstein, Director of Editorial Content, MECLABS, discusses the importance of delivering value to email subscribers. PreGAME to Summit 2015, a Microsoft Dynamics® partner event, has partnered with MECLABS Institute to deliver marketing-focused training at this year's partner training event, to be held in Reno, Nevada, October 12-13.
reIMAGINE 2015, a Microsoft Dynamics® GP partner event, has partnered with MECLABS Institute to deliver marketing-focused training at this year's annual conference, to be held in Fargo, North Dakota, September 21-23. Morgan Spurlock, Academy Award-nominated director; Charles Duhigg, best-selling author of "The Power of Habit"; Michael Norton, Harvard Business School professor; and Flint McGlaughlin, CEO and Managing Director of MECLABS Institute, to share evidence-based digital marketing insights. 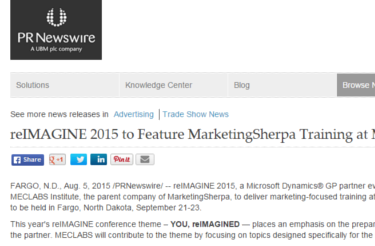 MarketingSherpa interviewed 47 executives who attended IRCE in June 2015. 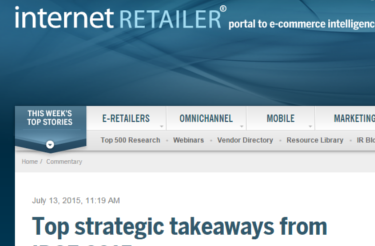 Three e-retailer strategies stood out to Daniel Burstein, Director of Editorial Content, MarketingSherpa, who conducted many of the interviews. Marketers to present success stories across major digital marketing disciplines; Early bird registration discount of $800 available until September 10. MECLABS Institute is named one of the top 50 fastest growing private companies in Northeast Florida. 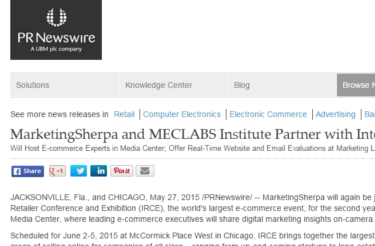 MarketingSherpa will again be joining forces with the Internet Retailer Conference and Exhibition (IRCE), the world's largest e-commerce event, for the second year in a row to host the show's Media Center, where leading e-commerce executives will share digital marketing insights on-camera. 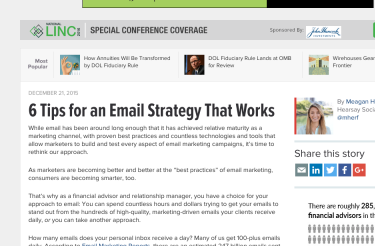 Daniel Burstein, Director of Editorial Content, MarketingSherpa, provides insightful ways in which marketers can increase email engagement by putting the wants of their customers first. Data sheds light on how frequently Americans like to receive promo emails, in what ways company emails can change and views on reminder emails. 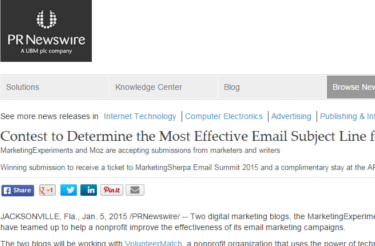 MarketingExperiments and Moz are accepting submissions from marketers and writers. 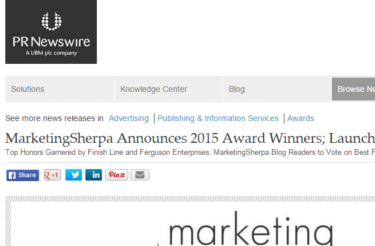 Top Honors Garnered by Finish Line and Ferguson Enterprises; MarketingSherpa Blog Readers to Vote on Best Finalist Email Campaign. MarketingSherpa interviews James Koons, Chief Privacy Officer, Listrak, at the 10th annual IRCE on Listrak's acceptance of The Online Trust Alliance's (OTA) online privacy award. 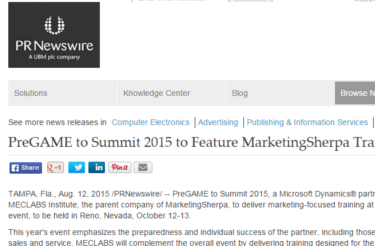 Pamela Jesseau, Senior Director of Marketing, MECLABS, analyzes the customer-focused marketing strategy employed by Debbie Pryer, Program Manager, Siemens Healthcare, who was a speaker at MarketingSherpa Lead Gen Summit 2013. 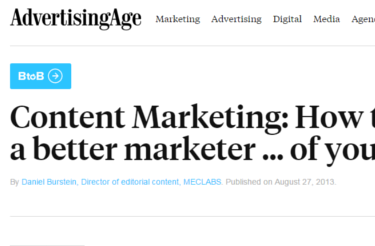 Daniel Burstein, Director of Editorial Content, MECLABS, discusses four tips marketers can use to better sell their ideas through content marketing. 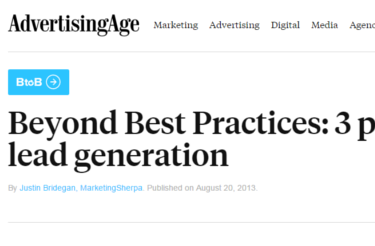 Justin Bridegan, Senior Marketing Manager, MarketingSherpa, shares insights on how marketers can develop a strategic plan for their lead generation efforts. 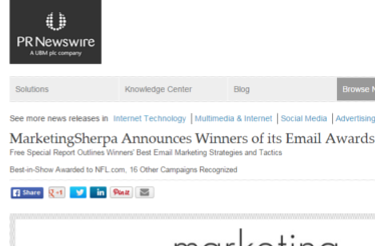 Best-in-Show awarded to NFL.com, and MarketingSherpa selects the industry’s top email campaigns of the year. MarketingSherpa announced Email Summit 2013’s keynote speakers, topics, case studies and tactical training sessions. 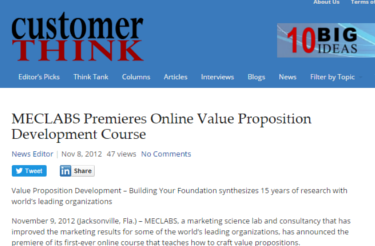 MECLABS has announced the premiere of its first-ever online course that teaches how to craft value propositions. 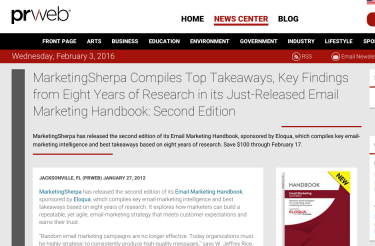 MarketingSherpa released its research findings in the newly published Email Marketing Handbook. 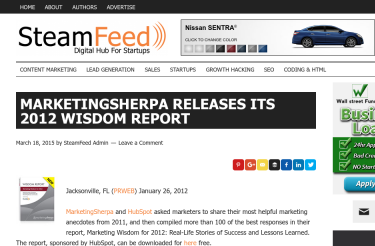 MarketingSherpa and HubSpot asked marketers to share their most helpful marketing anecdotes from 2011 and then compiled more than 100 of the best responses in this report. 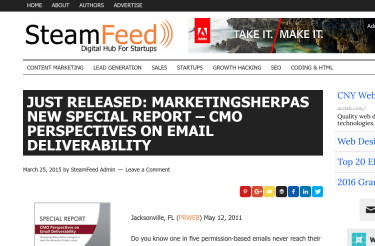 MarketingSherpa released its 2012 Email Marketing Benchmark Reports, which defined and detailed the state of email marketing today. 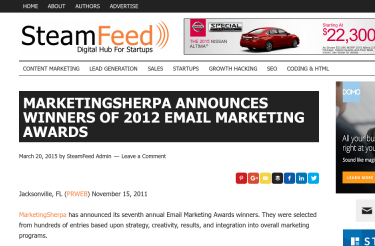 Best-in-Show awarded to Citrix Online and JetBlue, and MarketingSherpa selected the industry’s top email campaigns of the year. 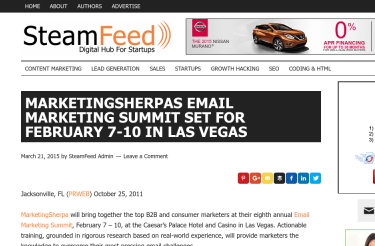 MarketingSherpa will bring together the top B2B and consumer marketers at its eighth annual Email Marketing Summit, Feb. 7 – 10, at Caesar’s Palace Hotel and Casino in Las Vegas. 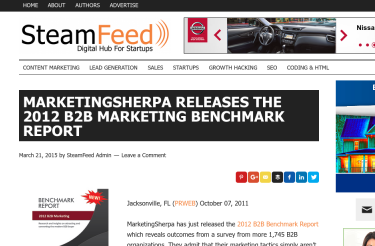 MarketingSherpa released the 2012 B2B Benchmark report, which revealed outcomes from a survey of more than 1,745 B2B organizations. 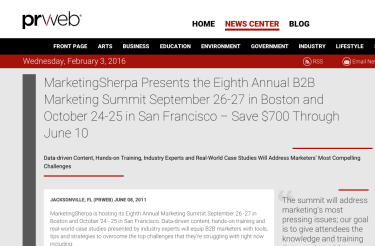 MarketingSherpa will bring together the top B2B and consumer marketers at its annual Email Marketing Summit, Sept. 26-27 in Boston and Oct. 24-25 in San Francisco. 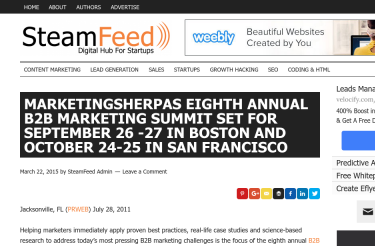 MarketingSherpa is hosting its eighth annual Marketing Summit Sept. 26 -27 in Boston and Oct. 24 - 25 in San Francisco. 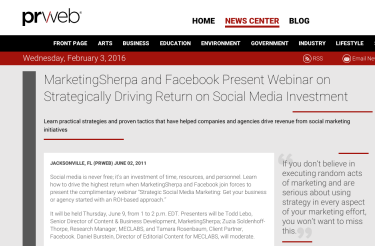 MarketingSherpa and Facebook joined forces to present a complementary webinar on how to maximize the effectiveness of social media marketing. 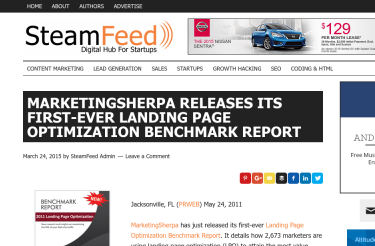 MarketingSherpa released its first-ever Landing Page Optimization Benchmark Report which detailed how 2,673 marketers are using landing page optimization (LPO) to attain the most value from their Web traffic and all related marketing initiatives, like search, email and social media. 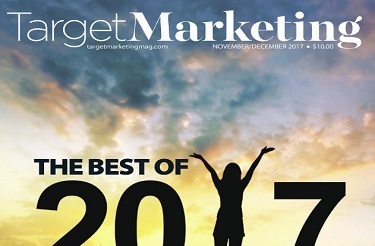 MarketingSherpa’s new special report revealed the latest strategies that nearly 250 chief marketing officers are using to ensure that emails reach their recipients. 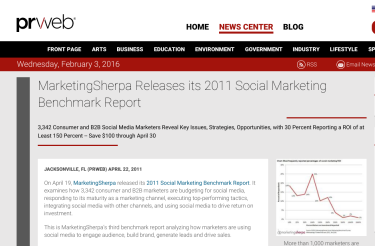 MarketingSherpa release its third benchmark report examining how marketers are using social media to engage audience, build brand, generate leads and drive sales. 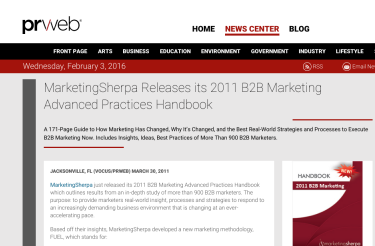 MarketingSherpa released a 171-page guide on how marketing has changed, why it’s changed and the best real-world strategies and processes to execute B2B marketing now. 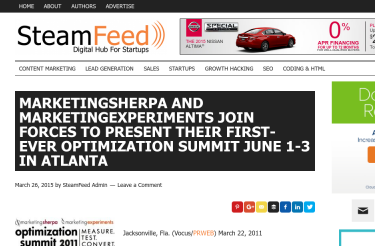 MarketingSherpa and MarketingExperiments will joined together to present the first-ever Optimization Summit, June 1-3, in Atlanta. 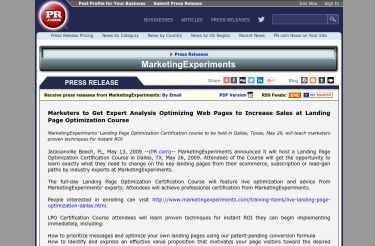 MarketingExperiments' Landing Page Optimization Certification course held in Dallas, Texas, May 26, taught marketers proven techniques for instant ROI. We are eager to share our findings and research with the marketing and general business communities. To let us know what information we can help with, please fill out the form below and we will reach out to you with more details.